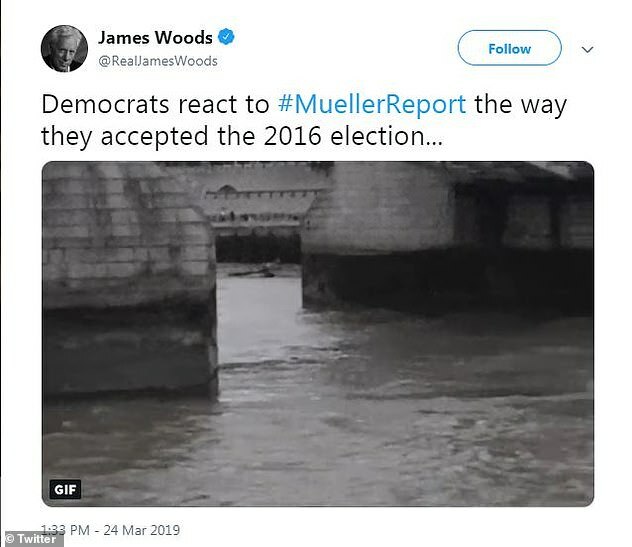 Celebrities have been reacting Sunday to the principal conclusions of Special Counsel Robert Mueller’s investigation which has cleared the Trump campaign of colluding with Russia. Mueller found no evidence of collusion between Donald Trump’s election team and Russia in the 2016 election but left unresolved the question of whether Trump had tried to obstruct justice by undermining investigations that have dogged his presidency. Even though Mueller’s findings were inconclusive over whether Trump had sought to influence the probes, Attorney General William Barr said in a summary released on Sunday that the special counsel had not found enough proof to warrant bringing obstruction charges against Trump. It marked a political victory for Trump and he claimed ‘complete and total exoneration,’ although his Democratic opponents quickly expressed dissatisfaction with the outcome and vowed to keep up their political assault against him. Mueller’s nearly two years of investigation ended with a finding that no one in Trump’s campaign ‘conspired or coordinated with the Russian government,’ according to the four-page summary of Mueller’s confidential report. 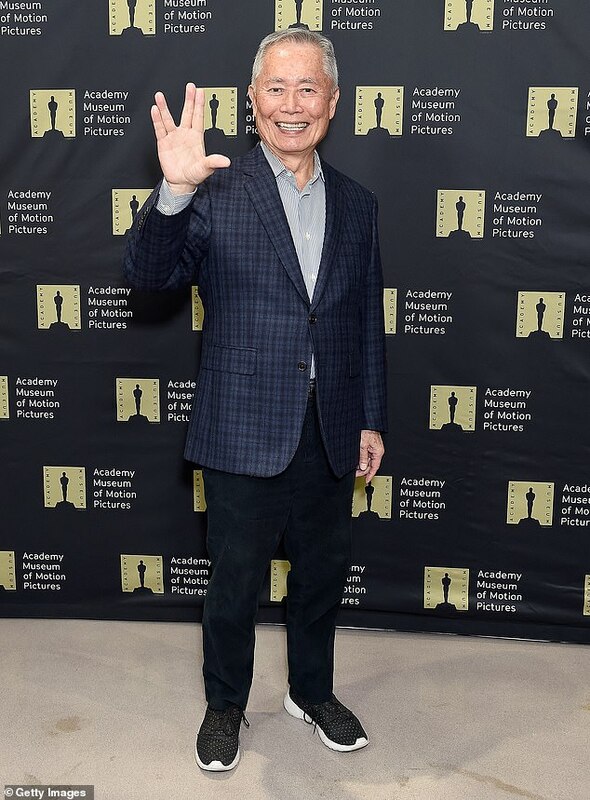 The news was met with disbelief in largely liberal Hollywood, where celebrities expressed their displeasure. Alyssa Milano tweeted: 'Well, if there was nothing in the report why won’t they just release it? 'If the report fully exonerated him or his family, he’d have it all out in seconds. 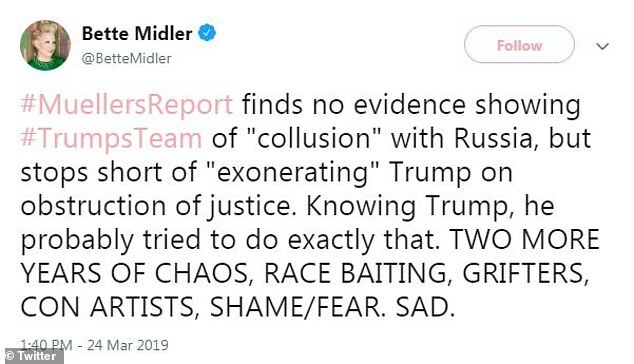 Actor and singer Bette Midler tweeted: 'No collusion. Soooooo....why did Trump spend an hour with Putin with no American in the room?? 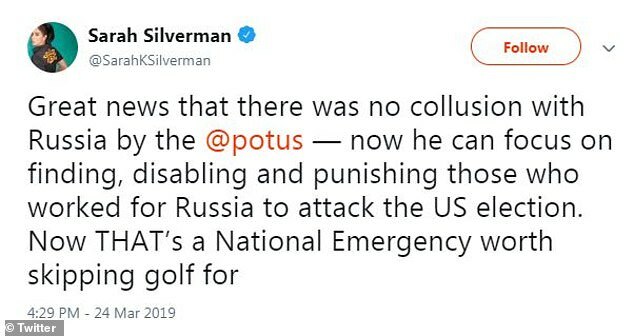 '26 Russian agents deported from U.S...but...no collusion...Ok.
Sarah Silverman tweeted: 'Great news that there was no collusion with Russia by [Trump]. Bill Maher, the host of Real Time on HBO, tweeted: 'Trump is already on to calling for "looking into the other side", i e revenge on the conspirators. 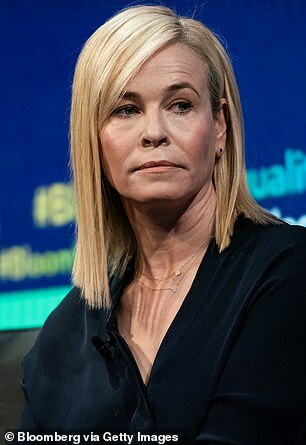 'Aunt Becky' is the character on the hit TV show Fuller House played by Lori Loughlin, the actor who was indicted in the massive college bribery scandal. 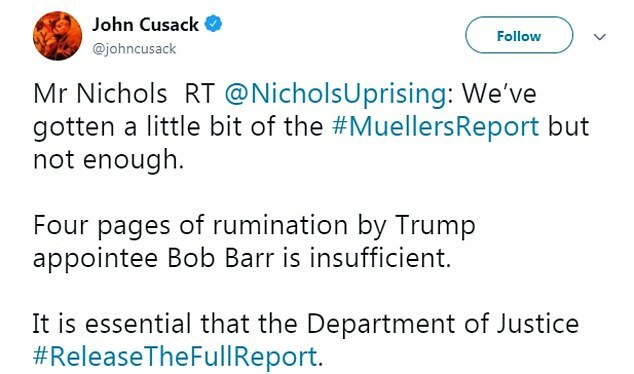 John Cusack, the liberal actor and star of High Fidelity, tweeted: 'Four pages of rumination by Trump appointee Bob Barr is insufficient. 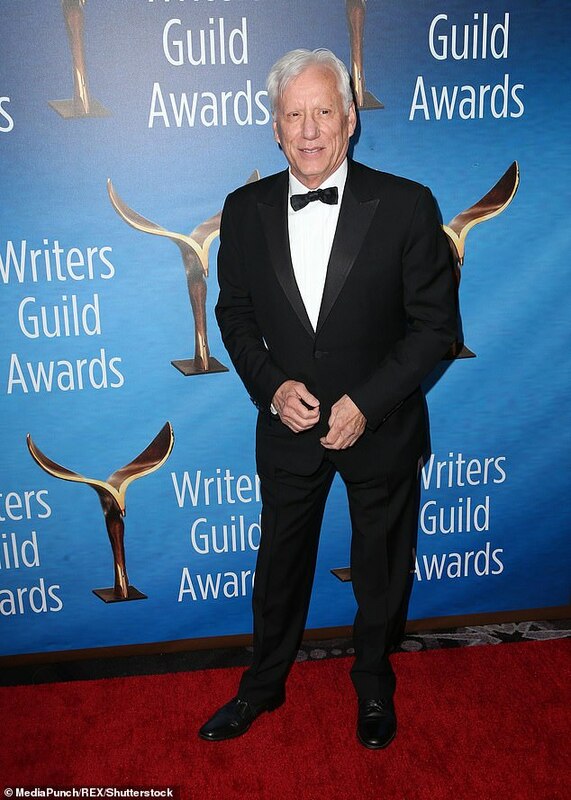 One Hollywood star who was pleased with Sunday's events is James Woods, the actor who is known for his conservative politics. The tweet includes a video clip of a man jumping off a bridge.